Combination drill and taps are very popular due to the vastly reduced time to drill and tap a hole versus conventional taps that require pre-drilling. 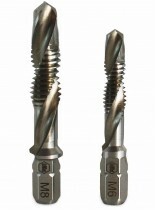 Combi drill taps are great for thin soft materials such as aluminum and steel sheet or conduit. Only suitable for through holes.